Blueberry Summer Pudding...This was so yummy! Judith Jones, is number 8 on Gourmet's list of the 50 Most Infuential Women in food. One of my favorites! She lived and worked in France after World War 2, then returned to the US to publish Julia Child's book "Mastering the Art of French Cooking". As the introduction to her book says, "the rest is publishing and gastronomic history". One thing I didn't know about Judith Jones was that she played a significant role in bringing "Anne Frank: The Diary of a Young Girl" to America. I read her book "The Tenth Muse" and found it to be a delightful and inspiring memoir. Besides Julia Child, she also worked with James Beard, Claudia Roden, Madhur Jaffrey and Lidia Bastianich. Not to mention Edna Lewis, Marian Cunningham and Joan Nathan. These were some of the most important and talented people in food. She writes about how M.F.K. Fisher was a mentor, friend and someone who taught her the art of eating, living and aging! I am in awe of this wonderful, talented women...At 87 she is still a senior editor and vice president at Knopf. She has long been a major force in the cookbook world. In August of 2006 she received The James Beard Foundation Lifetime Achievement Award. She is a true ground breaker! I made Judith Jones' Summer Pudding from "The Pleasures of Cooking for One". I had never had summer pudding before. I have always wanted to try it, so this was the perfect time. It was pretty easy to put together and absolutely delicious! I added a full cup of berries because I only had a 1 1/4 cup mold and it worked out great. My husband called it a keeper...Looks like I'll be adding this to my "go to" file. Judith suggests serving it with whipped cream but I went with vanilla frozen yogurt and it was perfect! Put the berries and sugar in a small saucepan with ¼ cup water. Set over low heat and let cook until soft, not more than 5 minutes. Remove from the heat. Taste when cool enough and add more sugar, if needed. Meanwhile remove the crusts from the bread and line a 1-cup mold with one slice of the bread, pressing it firmly into the bottom of the cup and up the sides. Tear off pieces of the second slice of bread to fill the gaps in the sides. Pour the berries and their juice into the lined mold and fold any overlapping bread on the top, then fill in the uncovered area on top with the remaining bread. Press down so the juices seep into all the bread, put a plate on top, and refrigerate for several hours or overnight. When you’re ready to eat the pudding, loosen the sides with a knife and then turn the mold upside down onto a plate. It should slip out easily. Enjoy with heavy cream, lightly whipped, if you wish. Mary of One Perfect Bite has organized a group of fellow bloggers to cook through Gourmet's list. Check out what she and others chose to make on their very lovely blogs! I love the retro feel of Judith Jones' recipes! I've never had this before, either, but it's nice to find another use for all the summer berries. It has a gorgeous color! I have always wanted to make this pudding as well. I have little heartshaped mods as well perfect for one special treat! I'm so glad you made this dish. Each time I came across it when trying to choose a recipe, I just got more and more curious about it. 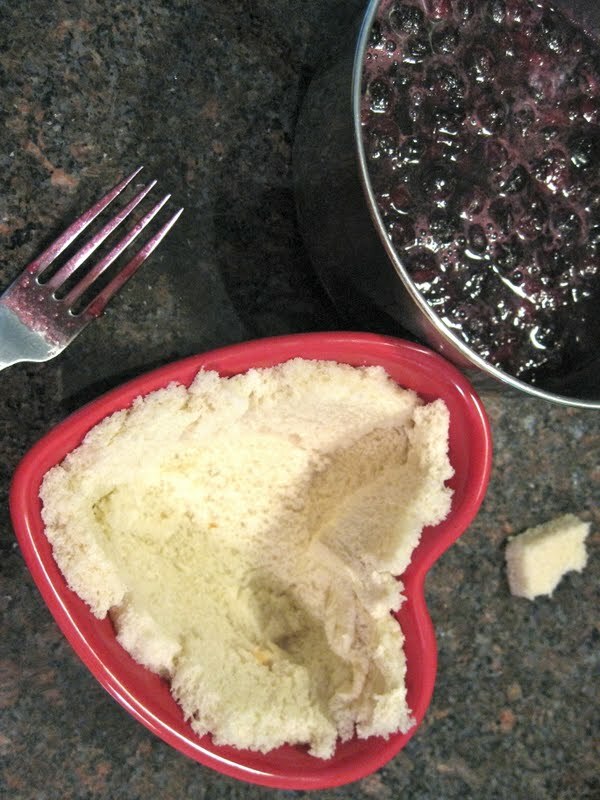 Your heart-shaped pudding un-molded beautifully! What an interesting (and quick) little dessert! Looks fantastic! This looks so good, Kathy! I am going to have to make this for my husband because blueberries are his favorite fruit and I am always looking for recipes to make with them besides scones. Judith Jones is a fascinating woman. I didn't know that she helped bring Anne Frank's diary to the U.S.! Great post! This is gorgeous, Kathy! I really admire Judith Jones. I enjoyed The Tenth Muse and some of the recipes of Cooking for One. I also have The Book of New England Cookery, which she wrote with her husband Evan.